It's been awhile since my last DIY project. 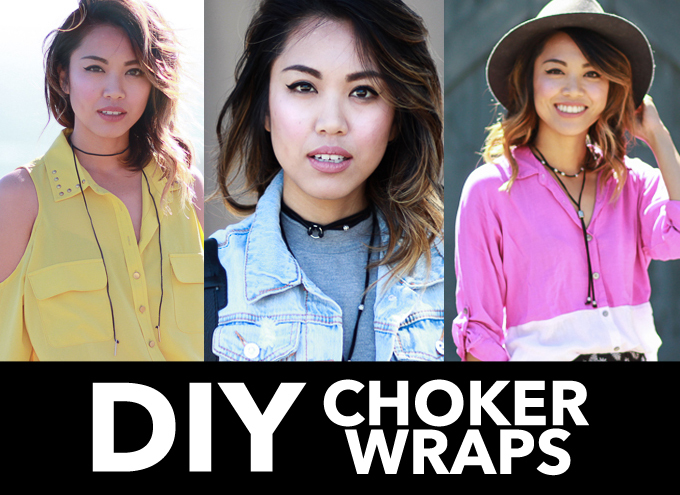 Choker necklaces or choker wraps has been trending lately. 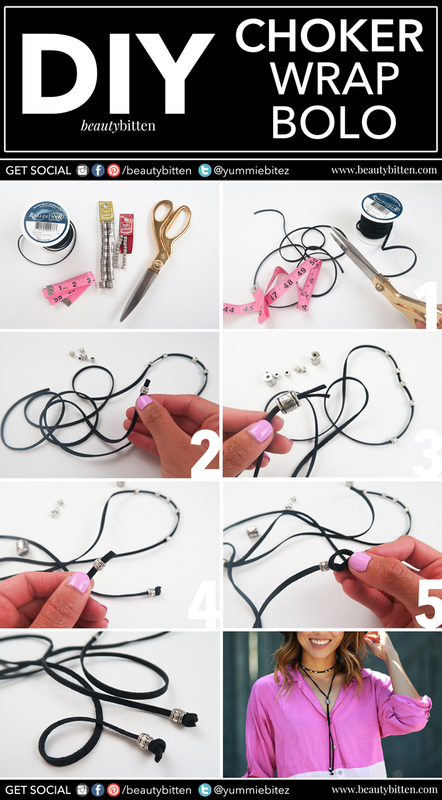 These necklaces are the easiest accessories you can possibly make. You can also put your own spin to it depending on your style. They're also so easy to make that you and your friends can easily make multiples of this together to last you until Fall. Watch the Video and Picture-by-Picture instructions after the jump. 1. Measure 50 inches of leather cord (or however long you want it) and cut. 2. Insert charm tags on both ends. 3. Tie a knot on both ends to secure the bar charms. Super easy! And this can add a simple flair to your outfit. You can wear this leather wrap bolo multiple ways: You can wrap it once, twice, or more. You also have the option of tying the ends to a ribbon or a knot for a different look. 1. Measure around your neck, and then add an inch to the measurement. 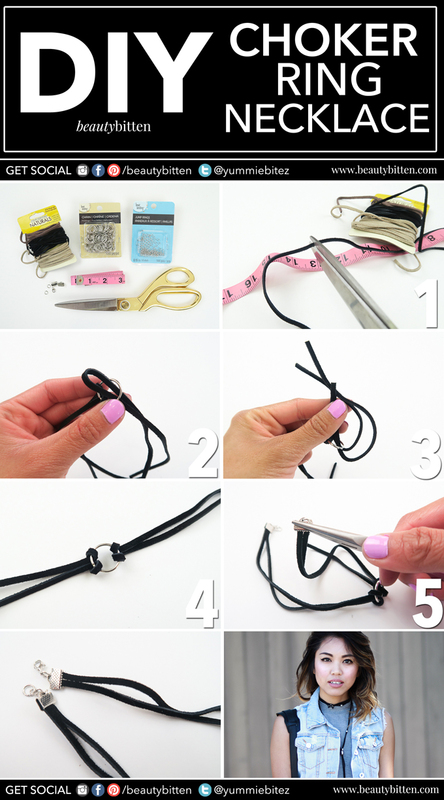 Cut two leather cord strings with this measurement. 3. Take both ends of the cord and insert it through the loop. Make sure to pull it tight. 4. Repeat step to the 2nd cord. 5. Attach the ribbon clasps on both ends of the cord. Clamp it down using a flat jewelry plier. Although this one is not exactly a wrap, you can easily layer this with the first and and third DIYs. If you're just into the whole 90's choker trend, you can easily wear this alone. This also looks great layered with another necklace. 1. Cut 50" of the suede leather cord (or desired length). 2. String smaller beads through the cord. 3. Take both ends of the cord and string the bigger bead on both ends. Pull the bead in the middle. 4. String one small bead on each end of the cord. 5. Tie a knot to secure the beads. Hope you're having a great Monday so far! 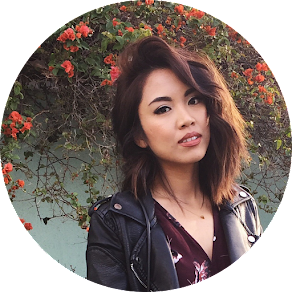 Make sure to share your DIY creations with me on twitter (@yummiebitez) or Instagram (@beautybitten) with the hashtag #DIYBITTEN, so I could see them!